Tony Sarg's Magic Movie Book. New York: B.F. Jay, 1943. [Sold] 27.8 x 21.7 cm. Rewritten in modern style by Hazel Seaman and Christina De la Motte. Cinderella; Three Little Pigs; Jack and the Beanstalk; Rumpelstilskin; The Three Bears; Little Red Riding Hood; The Sleeping Beauty; Chicken Little: I Went to the Animal Fair; The Owl and the Pussycat, along with eighteen poems and jingles. Five moveable plates, and two magic lenses, complete. 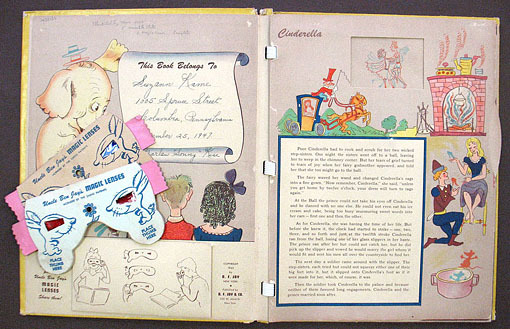 Colorful pictorial boards with spiral binding as issued.